Your Daily Cute: Two Cats Tuesday: BUSTED! 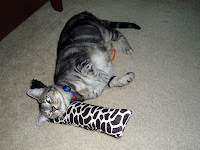 For Two Cats Tuesday today, I did a little undercover work. You see, Pimp and Moo put on a big show about not being the best of friends. They tolerate each other, but they make it a serious point to keep their own space (unless Moo is attacking Pimp, of course, in which case all space "rules" are off). 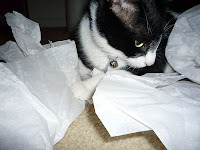 Lately, though, I've caught them doing some things I'm sure I wasn't supposed to see. I always suspected they loved each other when I'm not home, but I had no real proof. But in the last week, I've spotted them actually licking each other -- a little at first, then a little more... then a little more. 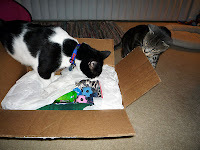 Another exciting Two Cats thing to report: We just received our "Paw it Forward" package from Tim from Everyday Living! 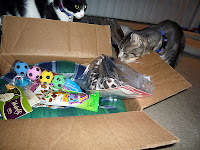 Paw it Forward is where you send a package of goodies to some kitties just because, then they send one another kitty, and so on! Now it's our turn to send someone a fun Paw it Forward package! If you would like to participate in Paw if Forward, just say so in the comments below. Make sure it's linked to your email or leave your email address. First one to say they want to do it, we'll send a package full of goodies your way! That last photo is SO CUTE!! Don't you hate when the humans capture these things?? don't they know we don't want the world to know we secretly love each other? Super video. Our staff would love to catch us but luckily she doesn't have a video camera. Boy are we lucky. No movies of us. We would love to paw it forward with you! Grooming, with paw action no less! 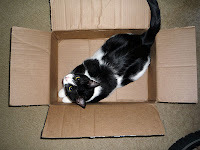 As always the box is the best gift of all! It seems that Koko basically tolerates Yum Yum, but I do catch him licking her, but then she'll start biting him and it turns into a fight. Oh well, go figure. Great PIF package! 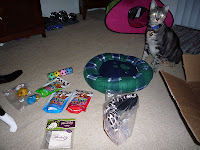 Look at all the cool toys and treats you got!! Pimp and Moo are so cute! It's good they love each other - even if they don't want anyone else to know it! 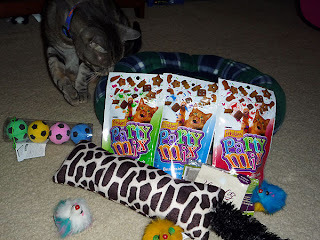 Their PIF box from Koko and Yum Yum is filled with lots of goodies and looks like they enjoy it!